There is no shortage of boxing action this weekend, with a number of big and important fights going down in various locations. The three fights that have attracted a good deal of the attention are the Anthony Joshua-Eric Molina fight (Yes, the under-card fight of Dereck Chisora Vs. Dillian Whyte has also attracted plenty of press and fan interest, but the word now is that the fight might not even happen. As a result of Chisora’s desk-throwing wobbler, the BBB of C must decide whether or not to allow the fight to go ahead), the Andy Ruiz Jnr-Joseph Parker clash and the Terence Crawford-John Molina Jnr showdown. Let’s take a look at each bout here and try and make an accurate prediction on how the action will go. Titles on the line: WBC/WBO super-lightweight, Crawford defending. The super-slick Crawford figures to have the advantage in almost every department barring sheer heart, which the gutsy Molina has in spades. Unless Molina can drag the defending champ into his kind of knockdown, drag-out, battle of attrition war, it looks like another dominant win for Crawford. Molina will give it his best shot but he gets outboxed and stopped late on. Titles on the line: WBO heavyweight, vacant. This one, set for New Zealand, could be the fight of Saturday night. Two hungry and unbeaten heavies who can punch, have skills (Ruiz, Bob Arum says, has the fastest heavyweight hands since the dazzling Muhammad Ali) and are desperate to win. Parker enjoys home advantage, Ruiz has arguably more experience. Expect a fast pace, plenty of leather thrown on both sides and switching momentums, before Parker finally emerges with a very close, perhaps debatable, decision victory in a fight so good it screams for a rematch. 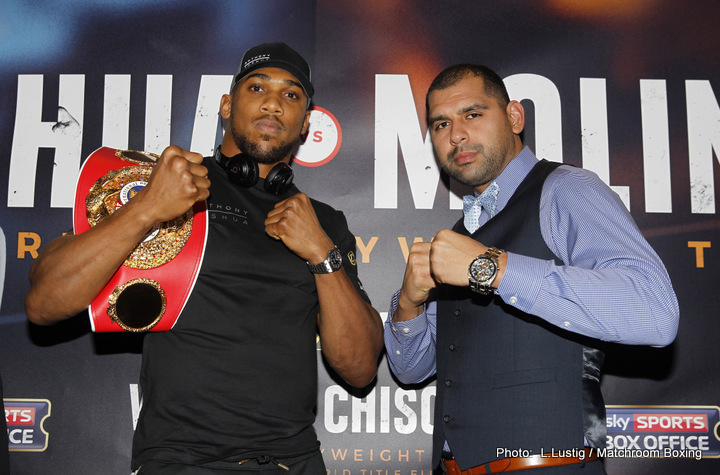 Titles on the line: IBF heavyweight, Joshua defending. Another blowout for AJ? A tremendous upset scored by the man who has made an art out of bouncing back? I go for something in-between. Joshua, despite his claims of not being distracted by the presence of the mighty Wladimir Klitschko, who he is all set to face next April, will try too hard to send a power warning to the former champ. Trying too hard to score the highlight reel KO, AJ will allow the dangerously determined Molina to blast him with a counter right hand to the head. This will happen in the second, after a cagey opener. To the alarm of the crowd, Joshua will wobble severely, being forced to hold on to see out the round as the challenger lets go with all he has trying to get the finish. Joshua will come out cautiously in the third and, as Molina goes for it again, it will be the defending champ’s turn to land a hurtful counter. Molina will go down, beat the count, but be waved off as he is on unsteady legs. Some will cry premature stoppage. Next boxing news: Terence Crawford would make 137 pounds for fight with Vasyl Lomachenko – for $10 million!